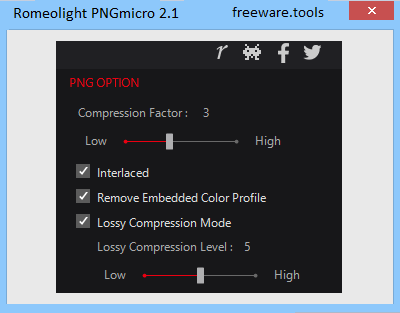 Portable Romeolight PNGmicro is a tool to optimize PNG images and reduce file size. By optimizing the PNG file and reducing its size, the amount of traffic is reduced, and the amount of time that it takes to download decreases. This can contribute to improved user experience. is equipped with two optimization modes. The "Lossless compression mode" enables you to reduce the file size without any degradation of image file quality. The "Lossy compression mode" intentionally reduces the image quality to further reduce large file sizes. It is possible to use the options to adjust how much of the loss quality. No installation is required to use this tool. Portable Romeolight PNGmicro is designed to help users in compressing their pictures. There are multiple options for shrinking files and embedded color profiles can also be removed. One of the great features of this program is that it allows users to control the level of compression. The standard shrinking allows for a significant reduction in file size. If, however, this is still not enough, a “Lossy compression mode” is also available. Using this basically means that a certain degree of quality will be sacrificed, in order to achieve better size optimization. This option is great for outdated images that are kept only for nostalgia. The lossy compression option saves them from deletion, but also frees up disk space. It strikes a perfect balance between data protection and space optimization! It is not uncommon for folders containing images to number thousands of items, or even more. Although this software does a marvelous job at reducing their size, sheer numbers can pose a real problem. A simple solution was found by allowing batch operations. Indeed the real power of this resource is revealed when processing multiple files. Not only can whole folders be loaded, but complete control is allowed when selecting which files to be compressed. Users should take note, however, that the utility only processes PNG files. Once the operation is complete, all relevant information is displayed. The old or the new size are easily visible and the program automatically computes the decrease in size, as a percentage of the original size. Portable Romeolight PNGmicro is very pleasant to use. There are no redundant menus and the skin is appealing. But the program is about more than just looks. It does its job marvelously and photography enthusiasts will find it a very useful resource.